I'm feeling pretty certain this was a hoax bid. Anyone with $100k to throw around like this could have specifically sought out a copy that was in good condition and still likely paid less. Funny thing is, the value from it is the fact that it was in the championship. the actual game inside it is no different than the regular game, and the championship sticker is so bad a modern home printer can make a fake that looks better. Essentially, you are paying for a regular super mario, rad racer and tetris, just with a name attached to it. It wasnt. there are only a couple of those in the world and they costs that much. Considering the condition of the cartridge is terrible (if the above picture is correct) and that the game itself is nothing more than time attack Mario/Rad Racer/Tetris, I would say this wasn't a great buy, but who am I to say, collectors gonna collect. It's actually usually the gold cart versions of NWC that cost. Don't get me wrong, the gray carts are still really rare, but $100K would be an incredibly unprecedented amount for one. Rest assured, I'll be keeping my eyes on this to update this article if necessary. For the time being however, this appears legit. If this does turn out to be a fake bid, I'd hate to be the guy in the selling end that's really, really hoping right now that it's legit. I'll be keeping my eyes out for an update. Could have sworn I saw someone yesterday reporting that the 100k bid was retracted, but I can't find it now. That it's actually worth that much doesn't mean the bid was legit. It wasn't. The bidder immediately insisted that the bid was placed by accident, and cancelled the transaction. 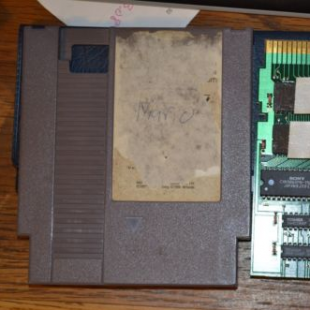 Close to $100k for this does seem like a lot at this point in time, especially given the condition of the cartridge there is no doubt about that. However at the end of the day I have to side with the seller here, the bid did go that high and honestly unless a technical error can be proven, the buyer should be held responsible for it, and face some serious penalties if it was a "Troll bid" or if they bid without the money. That said "100% buyer protection" is lulzworthy given that Ebay is infamous for scammers who create carefully phrased faux ads to sell people things like empty boxes for highly desired products, or in one case a rotten apple in an Ipad box (or something like that if I remember the story right). In general the victims here generally get scorned by the internet as well for not being more careful. I saw this mentioned on BBC last night. Took one look at the auction, saw it was $99K and knew it was a bogus bid. eBay is completely the wrong place to even try to sell stuff like this. 100k is pushing it but the gold cartridge for Nintendo World Championships does go for around 20k$ though. Collectors can be crazy sometimes.